Well, this square gave me no end of troubles. It didn’t want to be the right size. It didn’t want to lie flat. It didn’t want to be photographed. I started out with an H hook. Too small. Then tried an I. Too small still. And then a J. Too big. When I decided to try a J, I couldn’t find my magic J hook. It’s part of my special set of hooks for which I have no idea of the origin or brand. I’ve had them since grade school. They’re aluminum in shades of red (they don’t all match) and on the back of the grip it simply reads Hecho en Mexico. They are without a doubt my most prized crochet possession. If one of this season’s lovely hurricanes requires me to evacuate, these puppies are coming with me. But I digress. Once I found the Mexican J hook, the square behaved quite nicely. Was it the hook? Or was it the fact that I threatened the square with frogging and making it into a towel topper? I can’t be sure, but then when it refused to be photographed properly, I whispered, “Toilet tissue cover,” and the next picture was much better. Even when it was at its best, the corners of this square wanted to curl, but the first round of edging tamed it considerably. That round is worked a bit differently (crochet-a-longers take note and mind the instructions!) than for the other squares thus far. 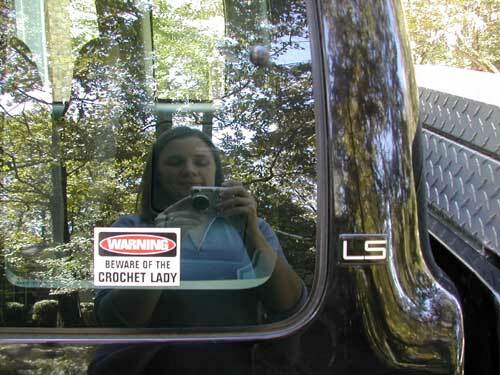 In my last post, I promised a photo of the Beware of the Crochet Lady sticker on my truck. Thank you again, Julie! 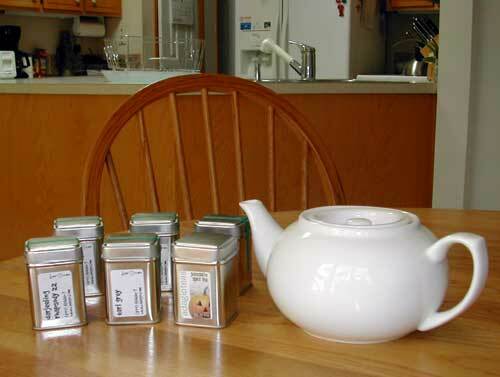 Last, but not least, my Adagio Teas package arrived yesterday. Thanks again, Tess! The simpliciTEA pot is absolutely adorable! At 21 ounces, it’s just the right size for me. Not only is it practical, but it’s also just too darn cute. I had my first cup today because FedEx always arrives at our house late in the evening, say around eight or nine, and I certainly didn’t want any caffeine at that hour. I ordered the black tea sampler and was quite pleased to find that they’d also included a free sample of one of their Halloween Teas, Pumpkin Spice. I tried the Ceylon Waltz first because you can’t go wrong with Ceylon. 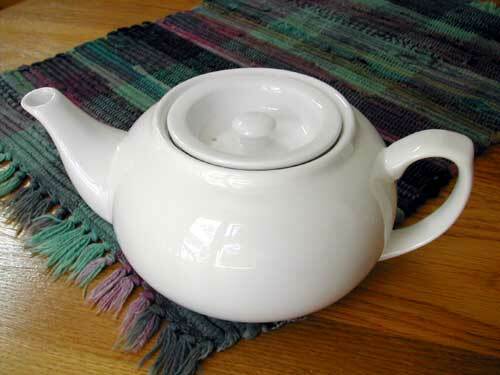 Here it is in the teapot, waiting for the water to boil. The Ceylon was was lovely, but it’s been so long since I’ve drank tea I’ll have to do more experimenting to tell you just how good (or not) it is. I’ll be sure to let you know! I like the look of it though. I’m glad you are enjoying the tea. That sticker is really cute. BTW I gave in to opening my SP gift. I couldn’t take the suspense. Just placed a order at ‘Adagio’ … thanks so much for posting that link! The square is very pretty though. And I like the sticker on the truck. We can see you in the reflection! Your site just keeps looking better and better, Donna. :) I LOVE IT! Ooh ooh ooh I want my tea stuff! Of course, I have to place an order, first. The square looks great, you did a good job. I do remember my curling just like that while I worked it. While I didn’t threaten to make it into a toilet tissue cover, I did make some serious threats to its well-being. That “beware of” sticker just cracks me up. 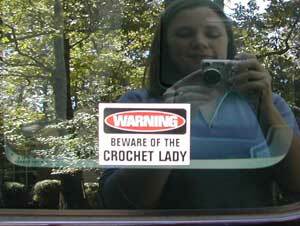 Every crocheter needs one!! What a neat little pot. Now I’m going to have to break out my tea stuff. It’s been ages..
Mexican crochet hooks! LOL!! Perfect thing to tame an uncooperative square.